The chimes can be made either as a musical instrument on which we can play different melodies, or as a sound instrument that itself produces graceful sounds. While the cheap buzz buzzes make sounds, they often don't match tones with each other. In this article, you'll find a way to make a tuned carillon or rebuild and tune into an existing one. The chimes are among the percussion instruments. Once upon a time, it banged on bells. The bells were later replaced by metal plates, rods or tubes. These can be made of a variety of flexible materials such as wood, aluminum, brass or steel. 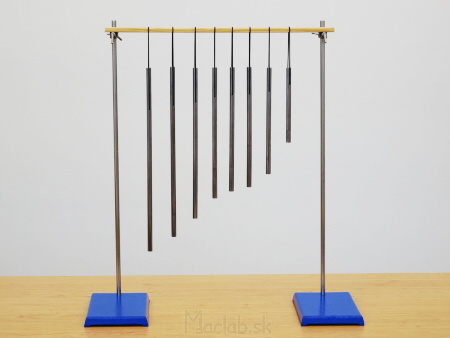 I used steel pipes to make chimes. I used pipes made of corrosion resistant (stainless) steel. All have the same diameter and wall thickness. The only difference is the different lengths. If we hit the pipe, it vibrates and emits a certain frequency tone. Different long tubes therefore emit different tones. The question is how much do we have to shorten these tubes in order to give off the tone of a particular frequency and to even tune with each other? Measuring the frequency using a tuner. We sort the pipes by length from the longest to the shortest and mark them with a serial number. 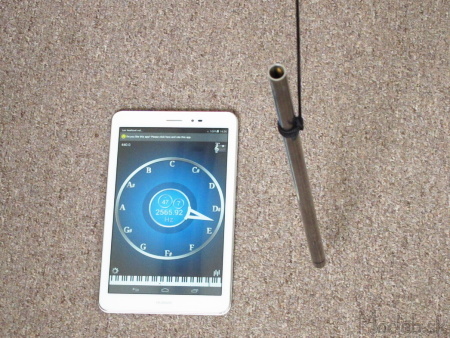 Using a tuner or app in your smartphone, measure the frequency of each tube's tone and write it down to a specific tube length. 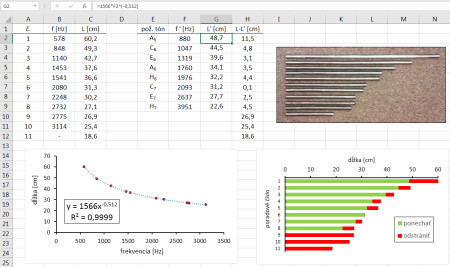 From the obtained data we plot the graph so that the frequency is on the x-axis and the length on the y-axis. Graph with table of measured frequency and length. Since pipe lengths are random, the frequencies they emit are random. We can increase the tube's frequency by shortening its length. To match the tones to each other, they must form a chord. For example, A-mol consists of the A, C, E tones and we add them to the H tone. Right-click the points in the graph and select the option to add a trendline. We choose the exponential option. Also check the Show equation in graph option. 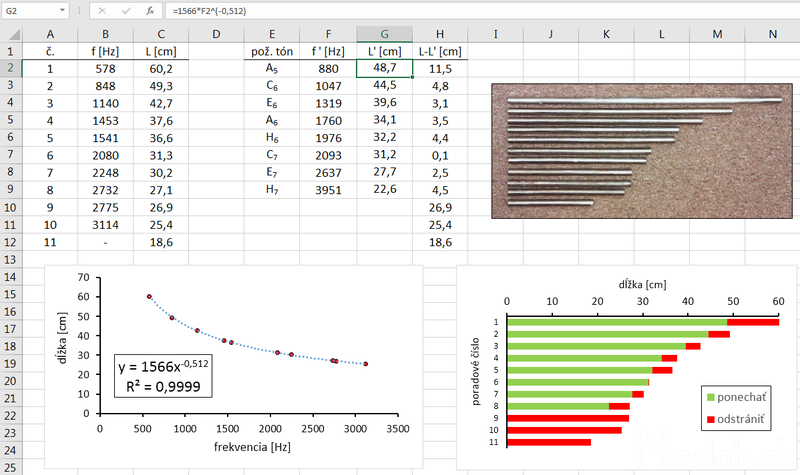 We will rewrite the formula to column G and substitute the frequencies from column F. The results of the calculations in column G are the specific lengths of the tubes that will give the particular desired tone frequencies. When cutting the tubes, we cut a length a few millimeters larger than we got the calculations. Cut the last few millimeters with a file and check the tuning to a precise tone with the tuner. 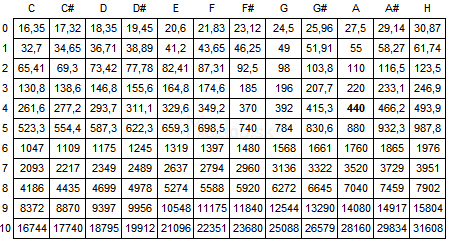 Calculate the specific pipe length for a specific tone frequency. Who do the graphs and calculations do have to do, it is enough to gradually shorten the oven and increase the frequency to the desired tone. Although this procedure is simple but very lengthy. Finally, when we have all the tones tuned in, we drill holes for hanging. The best positioning of the holes is 25% of the total length of the tube. At that time, the lowest attenuation occurs. Then we hang the tubes in a row and we can play. Or we can hang the tubes in a circle to make a wind chime. Hotová zvonkohra tvorí dva akordy A-mol doplnené o tón H.
Check video for listenig sound.